The famed psychic Sylvia Brown has nothing on Schlefstein’s Nate Abbot, a former cop turned private investigator. Nate’s supernatural dreams plague him, especially when tragedy looms for his own friends and family. He longs for a way of escape­, a personal redemption ­that would end the dreams, which began when he was a teenager. He’s also tormented by his current case of a missing girl. The pinnacle comes when his open case follows him on vacation. A strange twist of natural disasters strands his family and friends in the desert and puts all their lives at risk. Tormented by a death from long ago, he struggles to decode his dreams and ensure the survival of all his loved ones. 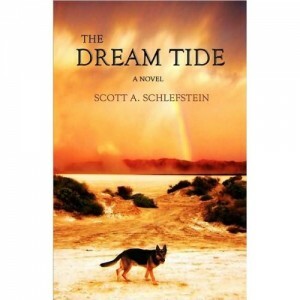 Dream Tide features a collection of modern cowboys on motorcycles, a heroic family dog, gunfights and surrealistic natural disasters, all adding up to Nate Abbot discovering that his world has changed forever. A real cliff-hanger not to be missed! Scott A Schlefstein is a former deputy sheriff and firefighter who ran his own legal support business for 14 years. He is also the author of an excellent Pursuit Magazine article Serving Divorce Papers is Never without Drama or Humor. Currently, he works as a writer and serves on a county commission for business & economic development. Scott lives in Northern California with his wife and two kids. I love this book. Having had this type of experiences myself, I could relate. It made me laugh and it made me cry. I will, most probably read it again.